Ribbons will be awarded from 1st thru 16th place for individual events, and 1st thru 4th place for relay events. Heat awards will be given to the winner of each individual heat. 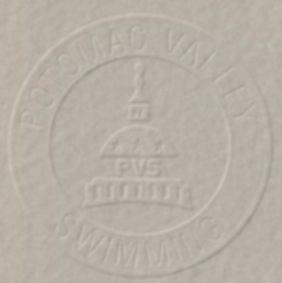 Open to all Potomac Valley Swimming registered athletes and invited USA Swimming athletes and teams. All clubs and athletes must be in good standing with USA Swimming and their respective LSC. Entries accepted on a first come first serve basis with priority given to clubs entered last year. It may be necessary to limit entries due to time constraints. Athletes shall compete at the age attained on the first day of meet. PVS and host clubs along with their Meet Directors are committed to the Inclusion Policy as adopted by the BOD. Athletes with a disability are welcomed and are asked to provide advance notice of desired accommodations to the Meet Director. The athlete (or the athlete’s coach) is also responsible for notifying the session referee of any disability prior to the competition. Current USA Swimming rules shall govern the meet. All events are timed finals. A contestant may enter no more than three (3) individual events per day. The prescribed PVS Warm-up procedures and safety policies will be followed. There will be two 25 minute warm-up sessions. Teams will be notified of their warm-up assignments. There is no admission charge. Programs for each session will be available for $3.00 each. Working officials and coaches receive a free program. Officials assigned to this meet should sign in at the recording table 10 minutes before the start of the warm-ups. Certified officials who have not been contacted and would like to volunteer should contact Ben Holly at 703-764-3153 or BHolly6275@aol.com, or speak with the deck referee at the meet. The host club will provide at least one timer per lane. Participating clubs are requested to provide at least one timer every session the team participates in proportion to their entries. Upon submission of the meet entry, clubs will be notified of the number of timers to be provided. Acceptance of the club entry is based upon compliance with the above..
Deck entries are $10.00 per individual event and must be submitted with payment no later then 15 minutes prior to the first event of each session. No new heats will be created. First come, first served. SPECIAL HOLIDAY MEET T-SHIRTS AND PATCHES WILL BE AVAILABLE IN LIMITED QUANTITIES. NO SNACK BAR WILL BE AVAILABLE AT THIS MEET. VENDING MACHINES ARE AVAILABLE FROM THE COUNTY. $5.00 per individual event, $12.00 for each relay. Make checks payable to "YORK SWIM CLUB". Entries may be submitted (1) manually, (2) by disk, (3) via email. The following general instructions apply regardless of method chosen. · Important: The above date is the deadline for clubs to submit their entries to the Meet Director. Therefore, clubs usually set an earlier deadline to receive entries from their swimmers. Check with your club for this information. · ENTRY FEES: $5.00 per individual event, $12.00 for each relay. · Make checks payable to "YORK SWIM CLUB". · Relays - Relay cards go directly to the timer in your assigned lane. For award purposes, PRINT CLEARLY the names of the relay members on the back on the relay card. · Any club that enters an unregistered athlete, falsifies an entry in any way, or permits an unregistered coach to represent them will be fined the sum of $100.00; no further entries will be accepted from the club/team until said fine has been paid. · Optional: Before preparing your entries, events for this meet can be downloaded and then imported into team manager (go to team manager/file/import/meet events). The file is available at 23mm120807. · For unattached swimmers not affiliated with a USA Swimming club, entries must be provided manually. Provide a list of events, times (if applicable), copy of USA Swimming Registration card, contact information, and a check for the total amount of the entries. · Manual entries from clubs must be submitted on the PVS master entry sheet. Also submit a completed "entry cover sheet". Signature and phone number of a club official must be included with entry for validation of entries. Teams entering 5 or more athletes in this format will need to pay a $1.00 surcharge per swimmer. · Forward to the address listed above in the General Instructions. · Submit the Hy-Tek commlink II file with an "entry cover sheet". Attach the team manager meet entry report files, one by swimmer and one by event. Include the name, phone number, and email address of club representative submitting the disk. · Attach the "meet entries" export file from Hy-Tek Meet Manager. Also attach a meet entry report by swimmer and a meet entry report by event. Create these reports in Team Manager and save as Word for Windows files. · In body of e-mail, give entry numbers (girls, boys, relays, total) and contact information (e-mail, phone, officials contact). · Submit entries to the Meet Manager, Nancy Monaghan at nancy@yorkswim.com . In the subject heading please indicate "2007 Reindeer Mini - ####" with the club's initials substituted in place of the number symbols. If the club is submitting entries from more than one location, please add the location to the heading with the club initials. Check payments must be received at the address listed above prior to the start of the meet. · Meet Directors are requested to acknowledge receipt by return e-mail within 24 hours. Clubs submitting entries that do NOT receive an acknowledgment should contact the Meet Director by other than e-mail to confirm receipt. SPECIAL NOTE: It has been rumored that a special envoy from the North Pole may make an appearance.